why blizzard ? Its good but why ? Awesome art, silence synergy, I like it. This isn't bad at all (except in aggro priest decks, which won't be a thing imho). This is an excellent minion for Inner Fire priest deck or in arena. Overall good. But kinda confusing. Why would a spiked Quilboar heal the opponent? Control minion with a strong statline, sort of like Twilight Drake. Could definitely see play. Much Better in priest than in other classes. This brings me back to the Injured Blademaster days of priest. If you stuck that on 3+Circle, you were winning all the trades. Even if it connects one time with the face, I think it's still worthy - the opponent needs to spend a lot of resources or some hard single-target remover to get it out of the board. I like it. Any way we can abuse this with Topsy Turvy, Auchenai Phantasm, Vivid Nightmare, and Circle of Healing? This isn't bad at all (only in aggro priest decks, which won't be a thing imho). Mistress of Mixtures is played in control decks. The art doesn't match with its effect. It suffers of Dr. Boom's scheme syndrome. Auchenai is back to meta. Even better then a fully healed Blade Master. You can make trades with this all day long; great in a control deck that doesn’t care about going face in the first 10+ turns. But she holds potions (or other kind of fluids), that heal both players. I don;t see how a Quillboar can do something like that. Look how mad it is. Yeah you are correct, this card seems worse than Twilight Drake, which is usually a 4/6. I don't why I rated this card so high. I am optimistic about this card. The healing part (e.g. against aggro or tempo decks) isn't that important. Its draw back isnt even that bad for how much it costs still. Im iffy on silence (outside of that silence summon a copy card), but this is good in that, and out of that. Initially I thought that this card was really good, but now I think this is just worse than Twilight Drake. Like you said, this seems only good in something like aggro silence priest. 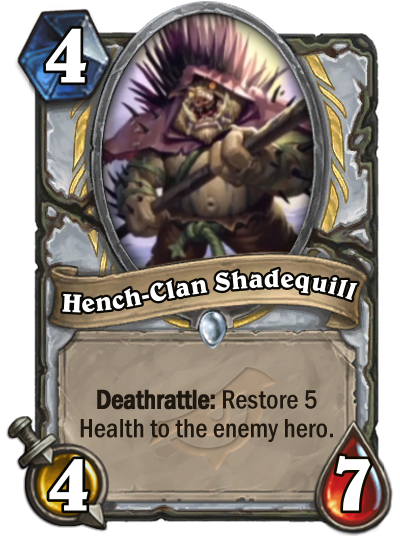 I think this makes a really nice class card and i am glad it's not neutral. Shadow priest can use this to their advantage, and silence priest can... yes.